Insurance companies selling through the health law’s troubled online marketplaces are scrambling to provide coverage by Jan. 1 even as swarms of customers are still enrolling and making their first payments. 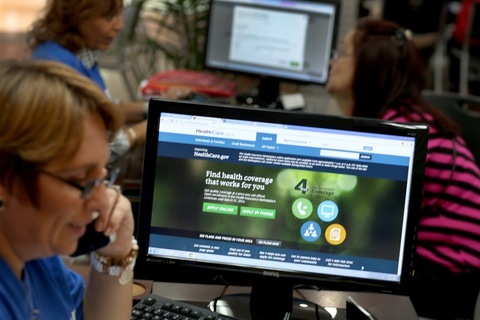 Federal officials and state regulators have repeatedly altered rules to allow the Affordable Care Act’s computers to enroll as many as possible before 2014 begins. In the latest deadline extension, the Obama administration on Monday announced that consumers can have one more day to sign up on HeathCare.gov, moving the deadline to Dec. 24. The combination of problem software, changing deadlines and shifting regulations over the last two months is unprecedented, insurers say. On Dec. 12, the Obama administration announced a series of changes to the health care law that included allowing individuals to pay their premiums, or even part of them, on the last day of the year for coverage starting the next day. PBS NewsHour’s Jeffrey Brown talked with Alex Wayne of Bloomberg News about efforts to prevent coverage gaps and spur enrollment. Medical plans, with potentially billions in revenue at stake in the health law’s expansion of private coverage, have hired extra workers to run phone banks and tangle with paper applications that were supposed to be processed online. They’ve assigned staff to pore through electronic enrollments that might be inaccurate or incomplete, or to remind customers to pay. They’re guiding applicants who were expected to sign up on the federal HealthCare.gov site or portals run by the states. “When you look at the problems associated with HealthCare.gov and how long it took to be fixed, it seems unfair to ask insurance companies to have their systems incorporate these changes within a few weeks,” said Stephen Zaharuk, an insurance industry analyst for Moody’s Investors Service, which rates bonds. Implementing the health law involved countless deadlines, but one that can’t budge is coverage for Jan. 1. On Thursday the administration disclosed another change, exempting those whose policies have been cancelled from next year’s coverage requirements and allowing them to buy high-deductible “catastrophic” plans. Fewer than 500,000 people face losing insurance because of cancellation, administration officials told reporters. Although marketplace enrollment for 2014 doesn’t end until March 31, many consumers are counting on insurance in January to replace expiring 2013 plans. Others without coverage, many with existing illness, have been promised for years that Jan. 1 is when they can have affordable, subsidized, comprehensive coverage for the first time. But thanks largely to computer problems that surfaced after the exchanges opened in October, fewer than half a million had signed up through November. Since then insurers and marketplace administrators have reported enrollment surges and substantially improved software. Call volume to Blue Cross and Blue Shield of Minnesota “sort of ebbs and flows with the wait times on MNsure,” the Minnesota portal that sometimes keeps people waiting an hour or more, said Scott Keefer, the insurer’s vice president of policy. Blue Cross Blue Shield of Michigan wrote a program to let applicants learn their eligibility for subsidies via phone text. Bowing to pressure, President Barack Obama in November announced changes to his health care law to give insurance companies the option to keep offering consumers plans that would otherwise be canceled. Health Care Service Corp. got a flood of calls related to President Barack Obama’s request last month that insurers allow customers to renew 2013 plans that don’t include required benefits under the Affordable Care Act, said Jeff Tikkanen, the company’s president of retail markets. HCSC runs Blues plans in New Mexico, Texas, Oklahoma, Illinois and Montana. That, too, required more staff, he said. The original signup deadline for January coverage was Dec. 15. In November, the Obama administration extended it to Dec. 23. On Monday, the deadline was moved back one more day, although officials at the Centers for Medicare & Medicaid Services encouraged people not to wait until the last minute to enroll. The administration this month also ordered insurers to accept payment even later — up to Dec. 31. Then insurers agreed to take payment until Jan. 10. Insurers have said little about the administration’s request that they provide Jan. 1 coverage for those who sign up and pay after that. In any case, nobody expects everything to be done on time. The health maintenance organization Kaiser Permanente expects some new subscribers to walk into clinics without yet having received their membership cards. Cigna, selling exchange plans in Florida, Texas and elsewhere, has set up 24-hour hotlines, and a team to deal with new members and “post-enrollment snafus,” said spokesman Joe Mondy. New subscribers should expect a welcome package, but “if they don’t get a binder within a week’s time, they need to call us and make sure everything is in place,” he said. Blue Cross Minnesota assigned people to double check electronic applications from MNsure. Another concern is that insurers might not get any enrollment file, flawed or not, from the federal HealthCare.gov site run by the Centers for Medicare & Medicaid Services. Insurers have reported continuing failures in data handoffs. Florida Blue advises new customers to print a screen shot of the enrollment confirmation on healthcare.gov just in case related emails and data submissions don’t get sent. “That gives them something to keep in hand,” Urbanek said. Kaiser Health News is an editorially independent program of the Henry J. Kaiser Family Foundation, a nonprofit, nonpartisan health policy research and communication organization not affiliated with Kaiser Permanente. Jay Hancock contributed to this report.